One of the many things that makes The Holy City one of America's friendliest towns is the abundance of animal lovers. My King Charles, Maddie, is such a good little lunch companion when she isn't begging, and I love how many local restaurants let me bring her along! There are also more and more stores popping up that allow you to bring your dog with you while you shop, and even specialize in fashion for your furry friend. Mount Pleasant has some great dog-friendly spots like the Americano (that I've highlighted here), and I also just discovered bringfido.com where you can find a list of pet-friendly travel and dining recommendations in most cities. 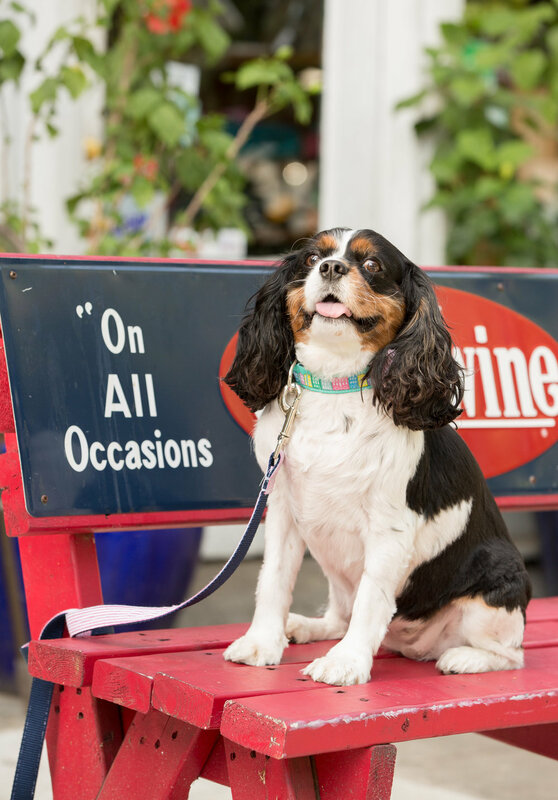 The following recommendations make for a great day downtown Charleston for you and your four-legged pal. 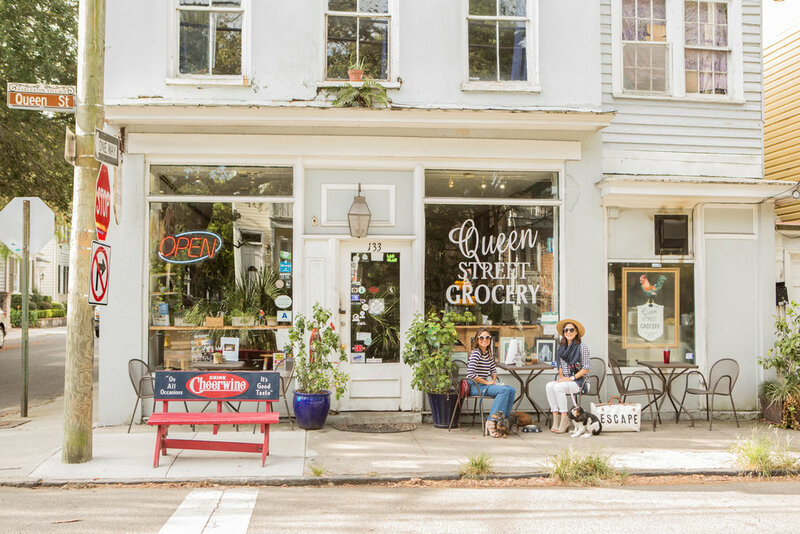 You can start with some shopping at Charleston Krewe on King Street and make your way over to Queen Street for breakfast all day at Queen Street Grocery. 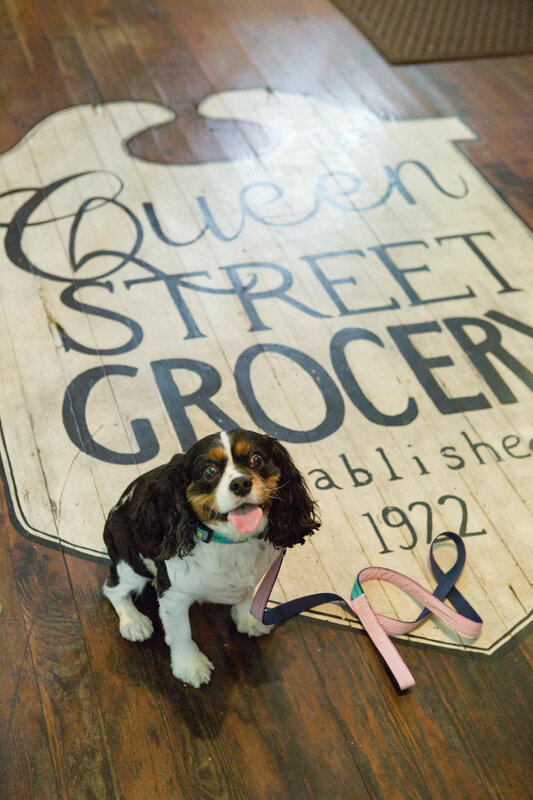 Not only can you bring your dog with you to this King Street store, you can literally shop for the whole family while you're at it. They have cute women's clothing, jewelry, and accessories (i.e. my hat and scarf that are pictured) as well as men's, children's and dog accessories. Considering this began in New Orleans, they have done such a great job translating charming Charleston details into their designs. 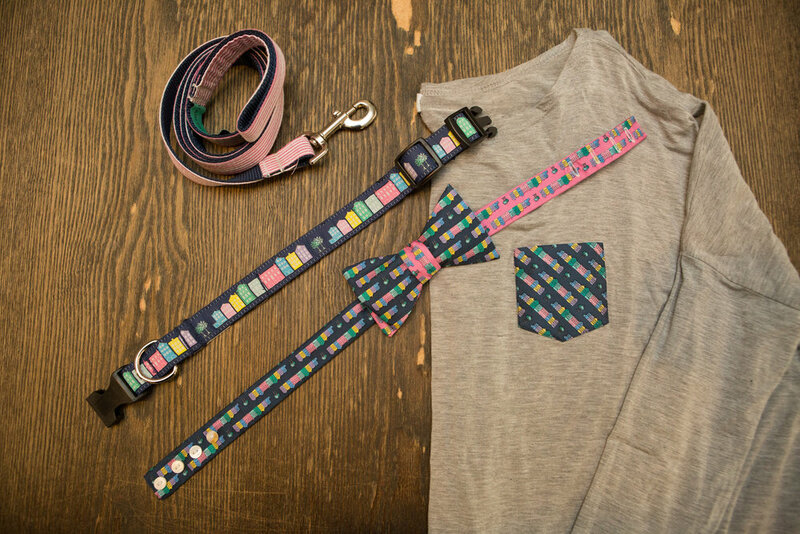 Their printed men's ties/bow ties, dog collars, leashes, and even women's pocketed Piko shirts have everything from oysters to carriages to Rainbow Row. I love brands that give back, so I was excited to learn that anything in the store with a Sea Turtle print donates 10% to the SC Aquarium & Rainbow Row prints help fund One 80 Place. QSG is no new kid on the block, and many of the College of Charleston grads I know frequented this place a lot back in the day. I kind of think it is underestimated as a solid choice to grab a quick and affordable bite without dealing with reservations, parking, or a huge wait. They definitely had me at "breakfast all day" and it has been one of my weekend go-tos ever since! If you haven't already tried one of their crepes, you better believe it will rival any breakfast sandwich in town, and the iced coffee is amazing if you go for the chocolate soy milk option. They will also make your pup will feel most welcome with a candy jar full of treats right inside the door, so you can grab one and then snag a spot out front for some horse carriage watching! I come here a lot when I need to grab an affordable bottle of wine, too. Last but not least, QSG has recently become one of my favorite Instagram accounts. Their Insta offers a daily does of killer inspirational food combinations and quirky humorous posts. After you are as full as a tick you can grab some lemonades from their cooler and head over to the newly revamped Colonial Lake to sit or stroll. Honestly all that Colonial Lake construction traffic had me on a hiatus from QSG there fore awhile, but now the whole area is better than ever! 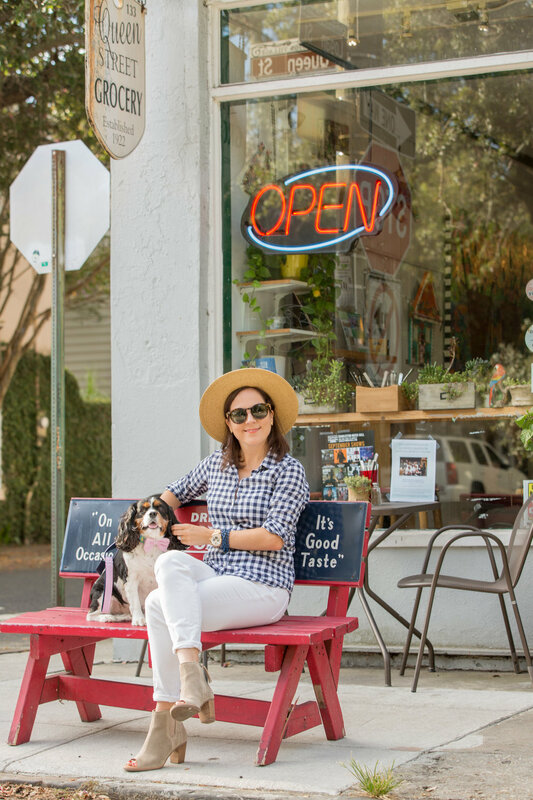 Andrea Serrano of Charleston Shop Curator and I had the best time hanging with our pups by the lake. The Charleston Parks Conservancy always has their park angels working hard to keep it such a lovely spot. All images by Clifford Pate Photography. A SWEET Giveaway and Discount! I hope you have been enjoying some of the sneak peeks of the #DandyWeekendatSweetgrass on Instagram! Today you can read about what inspired me to make my bold move to Charleston over at skirt! magazine's blog, featuring some fun photos from our shoot at a stunning Sweetgrass Properties location on Kiawah. Sweetgrass has teamed up with Dandy Boutique and me to giveaway some great items to our followers! Head to instagram and make sure you are following @sweetgrassproperties, @dandyboutique, and @charlestonweekender, then tag 2 friends in the following photo on any of our accounts to enter. Our winner will be announced Sunday August 28 and will get an Escape bag, a Turkish towel, a swan float, and a chic pair of sunglasses, with a total value of almost $250! This is open to anyone in the US so get to following! Even if you don't win, you can still score a great discount on my Turkish towels all week long! They will be 20% off for the duration of the contest, just use code SWEETGRASS for your discount on any of my towels. I've added some new styles, too! You can also shop Escape bags here while they last.